Call them Froebel, Advent, Pennsylvania, Polish, Swedish, Christmas or German stars, they are lovely little ornaments! Hang on your Christmas tree, use to decorate or give as gifts. 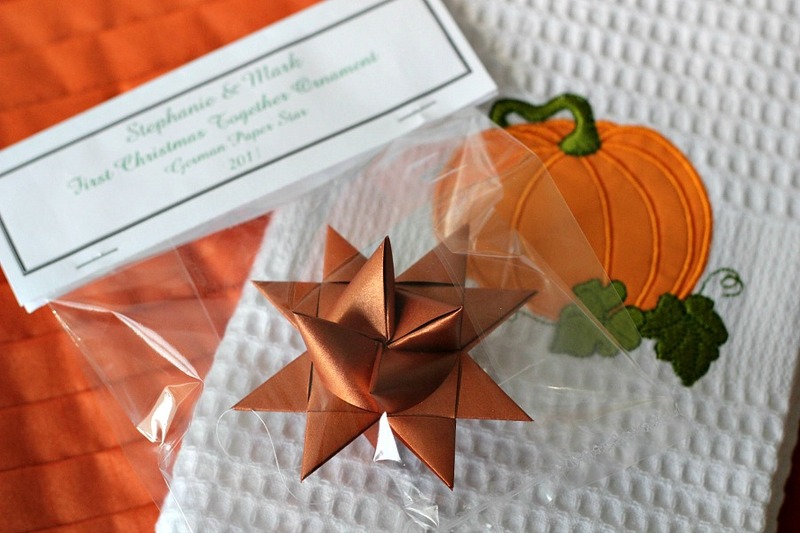 Packaged stars with an enclosed, personalized card make a lovely gift. 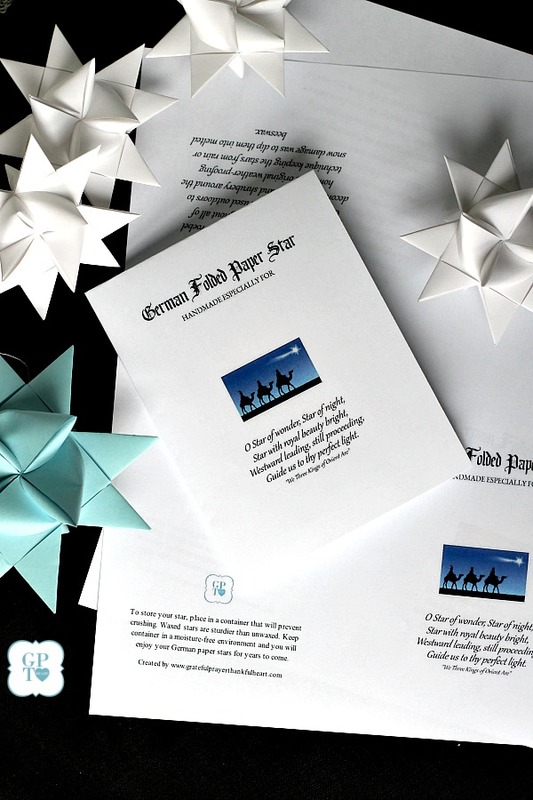 My German star video tutorial shows you how to make lovely 3-dimensional stars by weaving and folding paper strips in about forty steps. These sweet ornaments are made using nothing more than strips of paper. There is something so rewarding about creating an object of beauty from paper. The three-dimensional star is assembled using four paper strips. It takes about forty steps of weaving, folding and turning to produce the points and cones and finish the star. It might sound confusing, but you can create stars too, following my tutorial video. I show you each and every step right to the very end. Pause the video when needed and before you know it, you will be making lots of pretty stars! 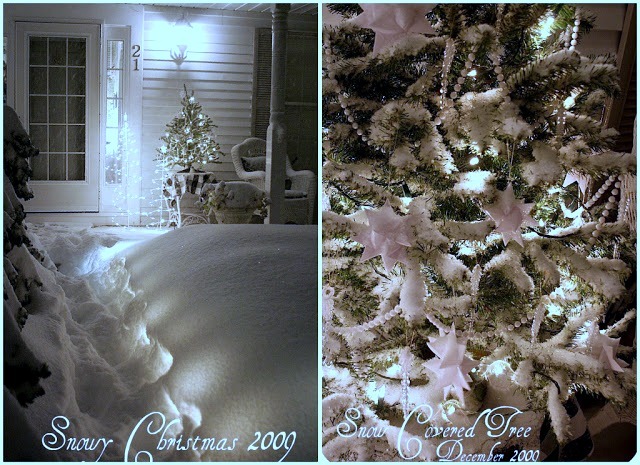 Besides using the stars as tree ornaments and embellishing gift packages, I have used them in holiday decor. 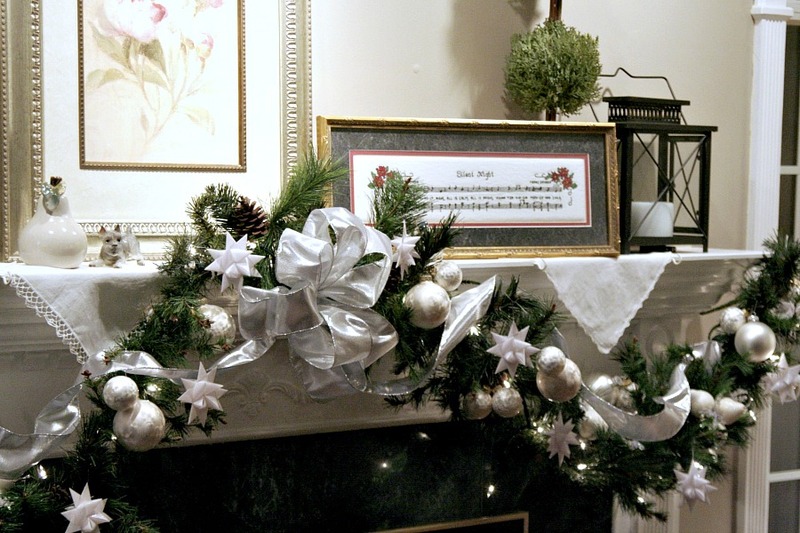 Here the stars are hung on an evergreen swag on the fireplace mantle. You can cut you own strips of paper. You will need lengths longer than standard paper (at least 24-inches in length and 3/4-inch wide) requiring a bit of taping the strips together. I have done this using tiny pieces of tape and being sure the edges line up. If there are uneven edges or tape isn’t perfectly pressed down, the strips may get caught in the weaving process. I prefer to purchase paper strips and provided a link for convenience. 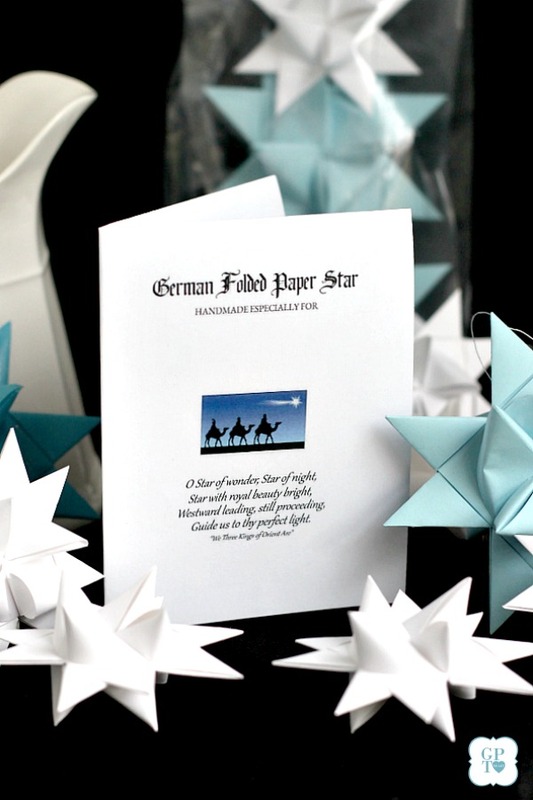 Traditionally, paper German stars were used outdoors on evergreen trees. The stars were protected from the elements by dipping them into melted paraffin. For added sparkle, diamond glitter can be sprinkled on while the wax is still soft. 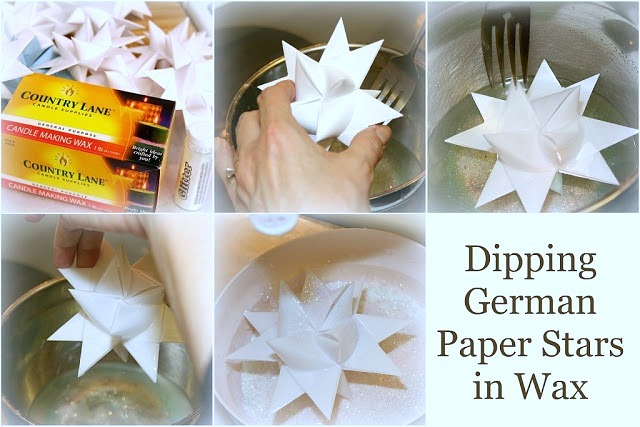 The folded stars are just lovely as they are but if you would like to give them protection for outdoor use, as I did when decorating the porch, follow the how-to by clicking Dipping German Stars in Wax. 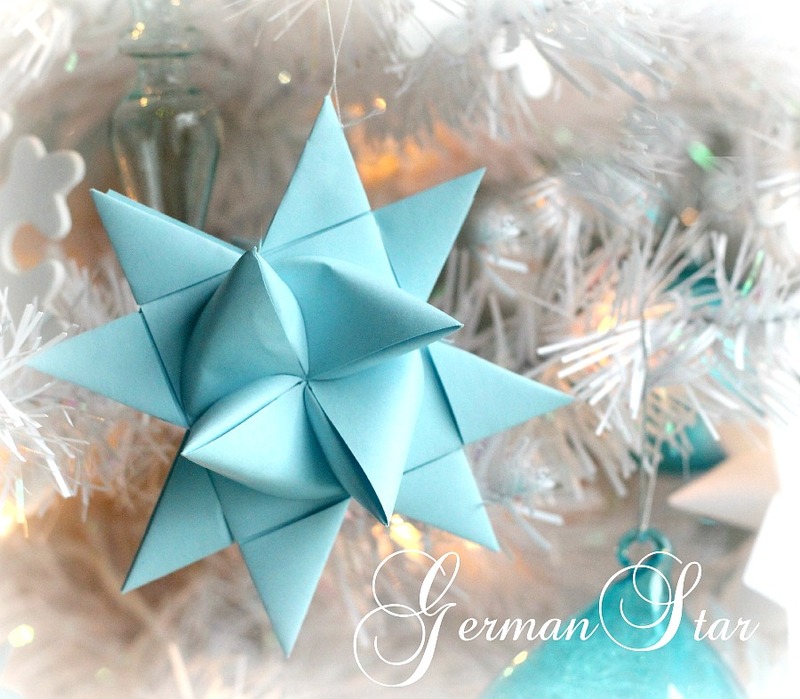 German star paper ornaments make sweet and thoughtful gifts for teachers, neighbors and friends. Package individually or in groups of three, six or however many you’d like. I like using clear, cellophane bags tied closed with a ribbon bow. 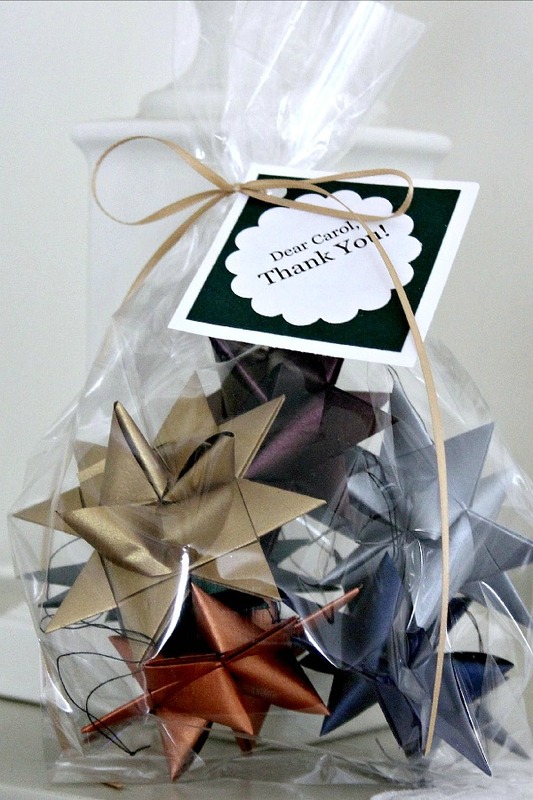 Make stars in different colors and use for different occasions. Here I gave them as a thank-you and for a bridal shower made in the wedding colors. Add to your packaged gift stars this card. There is a place for the recipients name, a little history about the stars on the inside and suggestions for storage on the back. Simply print it out and attach to the stars. The Great Dane has been making these for all of our 45 Christmases together. Your tutorial is so clear!…..I think I might even be able to make them!! 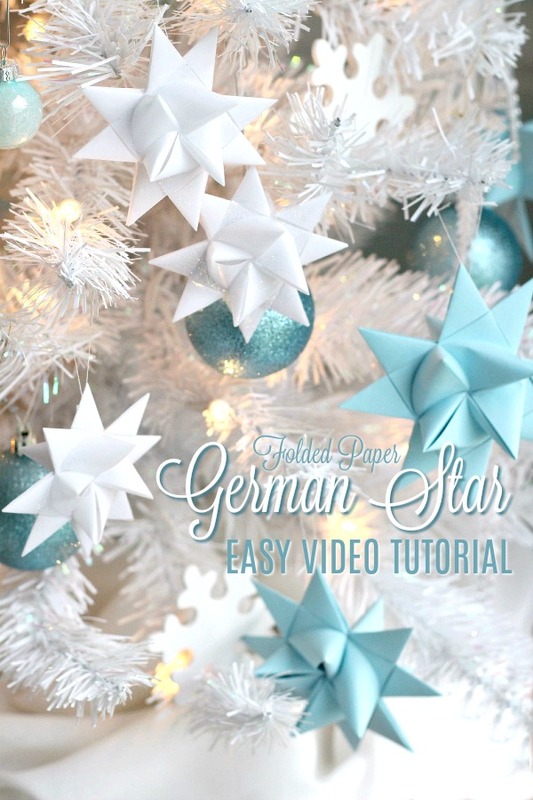 Your video for the folded paper German stars was how I found your blog so many years ago. It was so easy to follow. The card is a nice addition to give these as a gift.